I decided in light of my last post it might be nice to share with you guys some of my favorite low calorie cereal’s. I do want to note that during my cereal exploration I did spend more time investigating calories and not as much time focusing on the cereal’s in terms of nutrition. For that reason I decided to include a link to all items in Foodeducate to help you understand nutrition on each cereal as well. For those of you not familiar with Foodeducate it is a website that looks at manufacturer’s nutrition labels and ingredient lists and will assign a grade of A through D to various foods. Foods which are minimally processed and nutrient dense will receive higher grades. This means “real” foods are going to receive higher scores over processed foods. So an apple will get an A where Club Crackers will receive a D+. I highly recommend playing around on the website and checking it out for yourself! 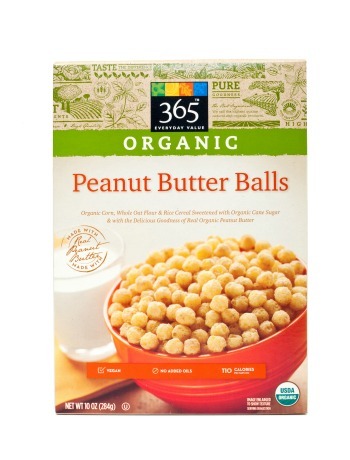 My favorite guilty pleasure cereal is Whole Foods 365 Every Day Value Peanut Butter Balls. Let me warn you this cereal is sweet, peanut butter goodness. I treated this cereal more as a dessert then a way to kick start my morning. It tastes delicious with just almond milk or I have even mixed it in with cottage cheese, fruit, or even grabbed it by the handful and mixed with some nuts and dark chocolate chips to make a trail mix. 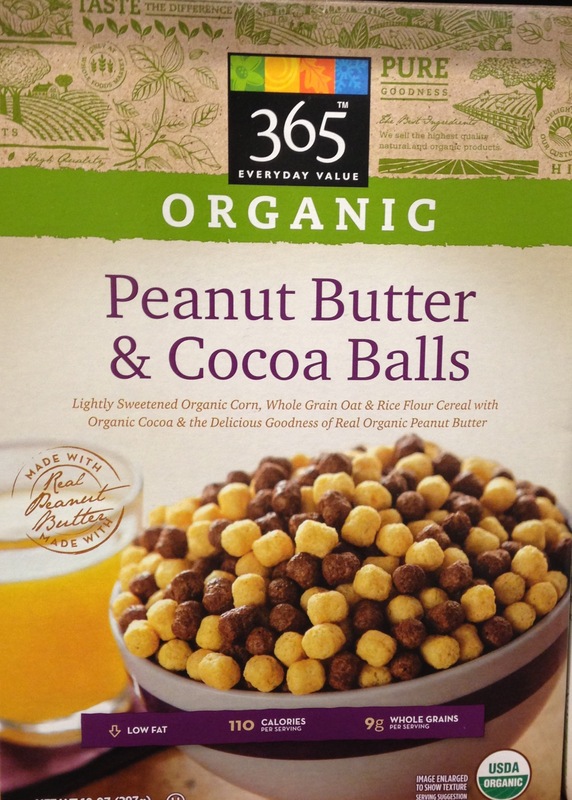 Whole Foods also recently launched this cereal in a version with Coco balls. I still like the original better, but the coco one is great for mixing it up. Both cereal’s come in at 1 cup for 110 calories. Foodeducate gives the Peanut Butter Balls a C+, but interestingly enough the new Peanut Butter and Coco Balls a B- even though they are pretty much the same. Both cereals are part of Whole Foods Private Label Brand 365 Everyday Value and can only be purchased there. Another recent addition at Whole Foods is the 365 Every Day Value Crunchy Cinnamon Squares cereal. If you grew up being a fan of Cinnamon Toast Crunch then this is the cereal for you. Again this for me is great for an after dinner treat or nice when I need a handful of something to indulge my sweet tooth. 1 cup comes in at just 90 calories and Foodeducate gives the Crunchy Cinnamon Squares a B+ rating which is not too shabby. 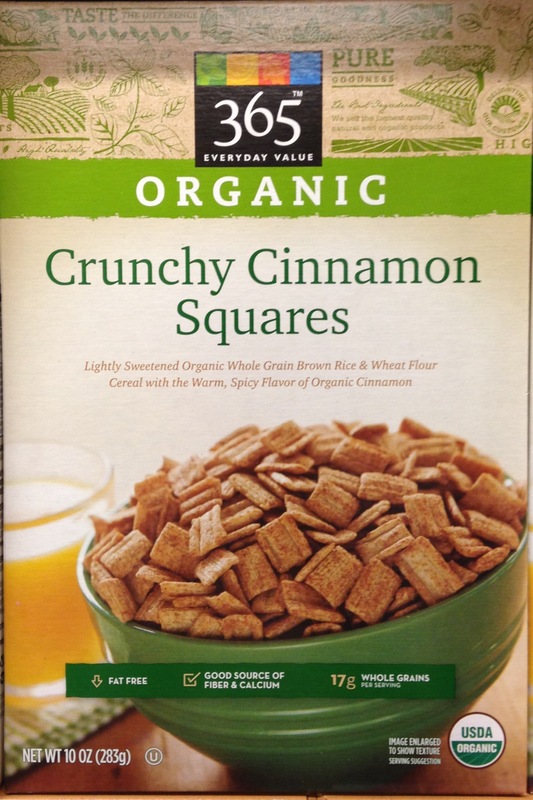 Crunchy Cinnamon Squares again is part of Whole Foods Private Label Brand 365 Everyday Value and can only be purchased there. 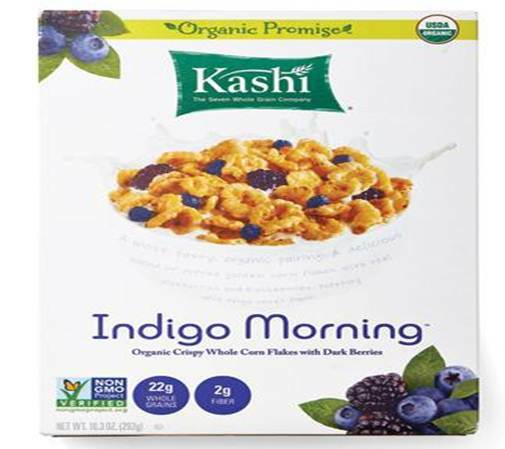 I found the Kashi Indigo Morning Cereal on my last business trip to Arkansas at one of their local grocery stores. After a long day of flying all I wanted was to go to my hotel room and have a big bowl of cereal before bed. I really like this cereal better dry then with milk. Once the cereal is in milk it loses a little bit of the sweetness it has, which for me makes it a little less delicious. However if you do not have a sweet tooth like me and want this for breakfast then with milk is the way to go. I also am not a fan of the dried fruit in it, so I will usually pick that out and add in my own blueberries. One serving of this is 3/4 cup at 100 calories and Foodeducate gives Indigo Morning Blueberry a B-. This cereal is a little harder to find, but I have found it in Molly Stones Grocery store and some other random smaller grocery stores. Arrowhead Mills has two of my favorite cereals that are not on the sweet/sugary side. 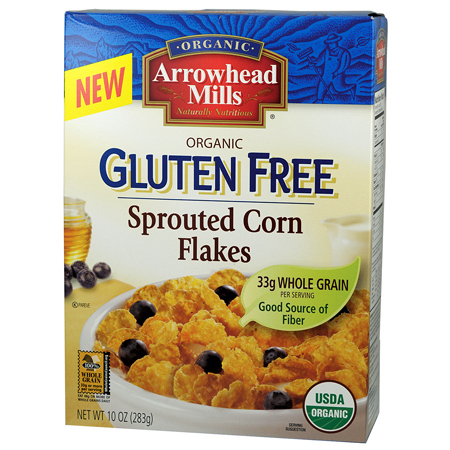 The first is Arrowhead Mills Gluten Free Sprouted Corn Flakes and the second is Arrowhead Mills Sprouted Wheat Berry and Quinoa Flakes. Both of these would be the cereals I would go to in the morning if I needed a quick breakfast. I also like to mix both kinds in with some of the other sweeter cereals in order to make the bowl a little less sweet and more hearty. The Wheat Berry and Quinoa cereal has a slightly lower calorie count coming in at 1 cup at 100 calories, while the Sprouted Corn Flakes is 110 calories for 1 cup. 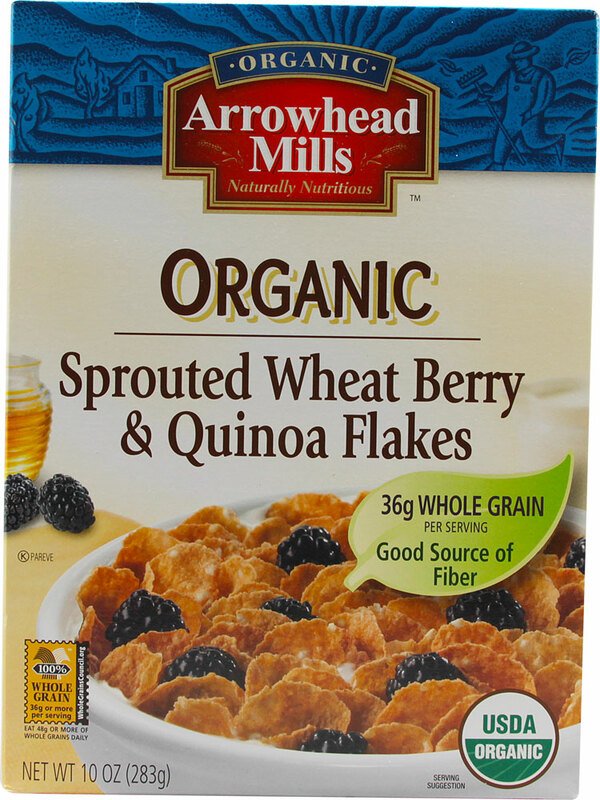 Foodeductae gives both the Sprouted Wheat Berry and Quiona Flakes and the Sprouted Corn Flakes a B for nutrition. I mainly buy these at Whole Foods, but have also found them in Safeway and other mass grocery stores. « Cereal, My Binge Worthy Food. What is Yours?